4.5 out of 5 based on 26 bloggers and 1 commenters. 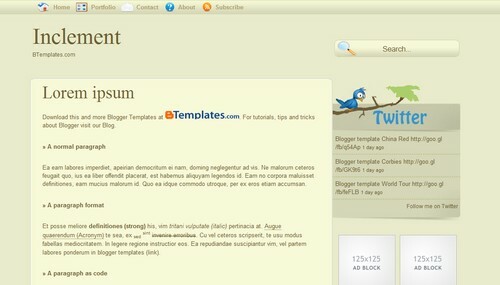 Inclement is a free blogger template adapted from WordPress with 2 columns, right sidebar, rounded corners, ads ready and social bookmarking icons. Hey guys, I am installing this template for my mom’s blog and I am trying to get the twitter widget to work, but nothing works…. Also, the date format I have it right and still shows “undefined”…. I will appreciate any help.